And he made from one man every nation of mankind to live on all the face of the earth, having determined allotted periods and the boundaries of their dwelling place. Acts of the Apostles, chapter 17, verse 26. Christianity is intrinsically linked to the Middle East. It is in the Middle East that Christianity was birthed in the backwaters of the Roman Empire and from where the message of the Christain gospel spread throughout the Roman Empire, to Ethiopia, and to the Persian Empire. The missionary endeavors of the Church of the East brought Christianity even further, beyond Persia and Arabia, to Central Asia, India, and China. The Greek language was initially the main vehicle and then also the Syriac language, a dialect of Aramaic. The latter language allowed the development of strong literary traditions in Syrian Christianity; particularly poetry and liturgy [that remains in use today], and also teaching on theology. The Archbishop of Canterbury is to be commended in his advocacy for the right of religious freedom and the important place of Christianity in the Middle East. However, today as in history, the existence of Christians in the Middle East, the birth place of Christianity, is being threatened by the rise of a resurgent Islam. In the 7th century, the growth of Islam changed the political, social and religious landscape of the region. Christians quickly lost large swathes of territory to Muslims, and from the religion of the State, Christianity turned into the religion of minorities. Christians became subordinates or dhimmis under the Islamic law. They had to pay special tax, jizya, and they often faced forced conversion to Islam. Ironically however, Christians of the Middle East are recognized as indispensable conduits of culture, knowledge, literature, philosophy and science to Muslims. It is in fact the Christians who enriched the Muslim civilization, among other things with Greek philosophical texts that they dutifully translated into Arabic (not surprisingly so, since Christians were fluent in both Greek and Arabic). While Christians under the Muslim rule had periods of relative security and protection, they also experienced intense persecution and brutality. The events of the late 19th – early 20th century made the Christians of the Middle East particularly vulnerable and they became one of the most uprooted communities. This dramatic dispersion and relocation of 19-20th century was due to the Damascus massacre of 1860, the Armenian Genocide of 1915 and the expulsion of Pontian Greeks in 1922. Sadly, these were not merely incidental, isolated events but they became a continuum, a systematic process of eliminating Christian community in the Middle East. War crimes, massacres, persecution and harassment caused a continuous exodus of the Christians and a drastic decline in numbers of a once dominant community. 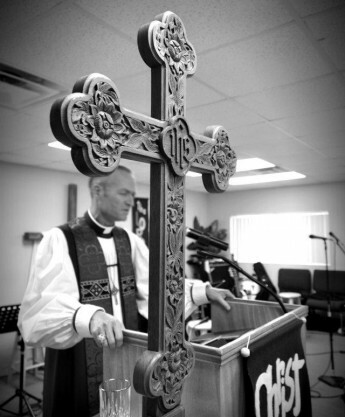 …many say it’s important to maintain Christian communities in the Middle East. They see the quality of their schools; their contributions as entrepreneurs, merchants, and as overwhelmingly middle- or upper-class consumers; and the religious plurality they inevitably bring as essential and enriching to Arab society. By playing a constructive and balanced role in the society, the Christian community in the Middle East served as social glue in the multi-cultural and multi-ethnic society. Scholars have long agreed that Christianity has been the engine driving social progress in the region. Of serious consideration is the important, and yet fading link between the ancient church in the Middle East and the modern-day Christian community worldwide. Their lonely fate is tragic not only because their history has been “lost” or forgotten, as Philip Jenkins aptly describes in his book The Lost History of Christianity. They have also been largely neglected as a community by the Western Church, despite their history, survival and perseverance in the Middle East. Western governments rarely factor into their regional strategies the Christians of the Middle East, though they have been living in the region since the dawn of Christianity. As a struggling minority, Christians have also been facing the brunt of conflict and insurgency. It was the Christian community who was targeted over the ouster of Mohammad Morsi, the pro-Muslim Brotherhood president of Egypt in 2013. Churches were set on fire in the Minya province, and Christians were systematically and violently attacked. Atrocities committed by ISIS in Iraq and Syria only plunged the region, and its Christian minorities, into a deeper crisis. All too often the plight of Christians is now described as a looming ‘genocide’ and ‘extermination’, irrevocable and brutal. Nisan argues further that it is Zionism that was there to help to deal with this syndrome, and turn Jews from feeling inferior to feeling proud. While the State of Israel and Zionism are highly politicized, lessons can still be learned from the experience of the Jewish community in the Middle East. The self-image of the ‘protected/ persecuted minority’ and recent experience of expulsion, flight and relocation of Christians in the Middle East has traumatic and long-standing consequences. The fact that the plight of fleeing Christians and other minorities received mostly silent responses from western governments only adds to their sense of abandonment and despair. Even the media would rather emphasize the recent assault on Yazidi community over similarly brutal and systematic attacks on the Christian community. While the West is often proud to celebrate its richness and diversity, the Middle East is on a path to become homogeneous and uniform. Not only is this an enforced unnatural uniformity in the ancient lands also known as the ‘cradle of civilizations’, it is also a very costly. The price is the exodus of its minorities and the eradication of their legacy, as is the case with atrocities in Iraq and Syria. It is a break in the continuation and transmission of the tradition of Eastern Christianity, a branch of Christianity where traditions are critical. It is a ruthless and forceful disruption of the religious community, their infrastructure (e.g. churches, monasteries), liturgy, rites and celebrations, and even language (e.g. Aramaic), all of which have existed for centuries if not millennia. Once the heritage of Christians in the Middle East is obliterated, their status as dhimmis is reinforced. If Christians are eradicated from the region, so is the eastern Christian civilization. This will be detrimental to the Middle East. The cost is considerably higher, as it is not only about forced expulsion and violence against Christians, but against anyone who is ‘other’. There is no guarantee that with the exodus of Christians and other minorities, the followers of the radical ideology will not turn on others whom they deem inferior or not proper Muslims. If the West does not respond, the East is bound to descend into even graver chaos. A poem by Ephrem the Syrian, one of the fathers of the Syriac church, a prominent theological and poet. I firmly believe that religious freedom and security in the Middle East are directly connected to the continuing strong, faithful and growing presence of Christianity in the region. Speaking in New York on the 29th of December 1949, Jacques Maritain, French Catholic philosopher and prominent drafter of the Universal Declaration of Human Rights wrote, in times of scandalous triumphs of falsehood and violence, an heroical inspiration and belief are needed, which is found in ‘none other than Jesus of Nazareth’. Ultimately, Christianity is vital to the Middle East because it is only through Jesus Christ that a world racked with violence and pain will find everlasting peace with Almighty God. There is salvation in no one else, for there is no other name under heaven given among men by which we must be saved. This is why Christianity will always be vital to the Middle East. It is our responsibility to act and to raise our voices on behalf of Christians in the Middle East, their right to remain in their ancient, biblical and historic communities and to protect their valuable contribution to the Church and global civilization. Christopher Dawson,The Formation of Christendom. New York: Sheed and Ward, 1967, p. 150. Dimitri Gutas, Greek Thought, Arabic Culture: The Graeco-Arabic Translation Movement in Baghdad and Early ʻabbāsid Society (2nd-4th/8th-10th Centuries). London: Routledge, 1998, p. 3. Mitri Raheb, I Am a Palestinian Christian. Minneapolis: Fortress Press, 1995, p. 40. Christa Case Bryant, ‘What the Middle East would be like without Christians’, 22 December 2013, www.csmonitor.com/World/Middle-East/2013/1222/What-the-Middle-East-would-be-like-without-Christians (viewed 29 August 2014). Philip Jenkins, The Lost History of Christianity: The Thousand-Year Golden Age of the Church in the Middle East, Africa, and Asia and How It Died. New York: HarperOne, 2008. Mordechai Nisan, Minorities in the Middle East: A History of Struggle and Self-Expression, 2nd edition. Jefferson, N.C: McFarland, 2002, p. 265. Thomas Oden and Cindy Crosby, Ancient Christian Devotional: A Year of Weekly Readings Cycle C. Downers Grove, Ill: IVP Books, 2009, p. 110. Kenneth Parry and John R. Hinnells, The Blackwell Dictionary of Eastern Christianity. Oxford: Blackwell Publishers, 2001, p. xv.